March is a big birthday month for me – it starts off with my favorite little boy in the whole world, Rory and ends with my favorite old fart, my dad. Today is my dad’s birthday and I gave some hints about what his card was going to be this year. I also said he was turning 66. He is not, he is turning 65 today. I always figure out how old people in relation to my age, but the problem is, I frequently forget how old I am. I thought I was 36 the day I wrote that and I am not. I am 35. Last week I thought I was 28 – it’s a crap shoot if you ever ask me how old I am. I called my dad this morning to wish him a happy birthday and to make sure he got his card. Oh yes, he got it and he said he laughed until he had tears. Mission accomplished. I now present to you Grandpa’s Birthday Card 2.0. There was some concern, namely from my mom, about Kamryn crying during the process of making this card. The reason she was crying was because she was having a really hard time holding up only her middle finger. She points at stuff all the time with her “Tall Man”, but asking her to do it was apparently harder than I realized. 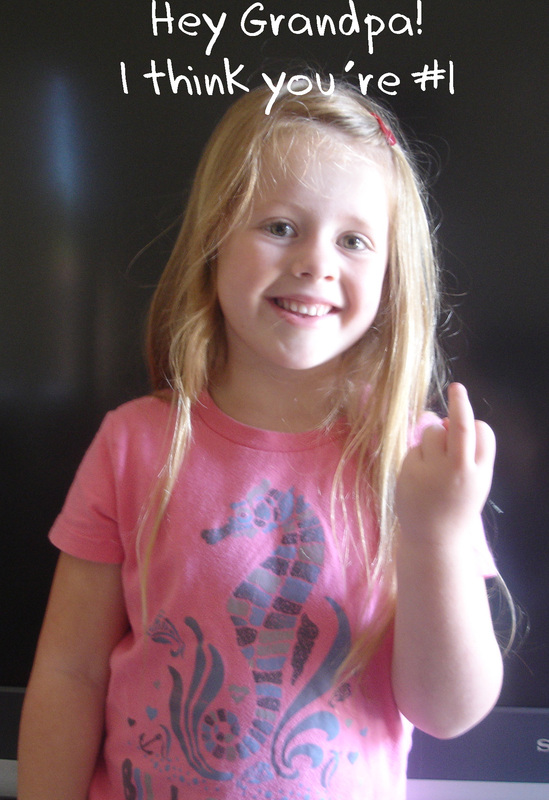 She kept asking why she couldn’t use her index finger instead and I told her that if she holds up her middle finger it means that Grandpa is super#1. I really tried to get Rory to do it too, but he wasn’t even close. That’s OK because he’ll most likely have to be my assistant next year since Kamryn is catching on to my shenanigans. This entry was posted in Uncategorized and tagged Birthday card, Grandpa is #1, Grandpa's birthday by Amy. Bookmark the permalink. Absolutely! It’s important that they learn early. Badness runs wild in Californ i a.